Más tarde, hoy te presentaremos nuestra visión de las mejoras de Exploración, en una publicación en el foro, y esperamos escuchar lo que piensas. Como este tema funcionará de forma diferente a los temas anteriores de Enfoque de la retroalimentación, le pediremos que comparta sus comentarios sobre el tema en sí. Además, durante las próximas semanas, le presentaremos resúmenes de las características que llegarán al capítulo final de Beyond en una serie de publicaciones en foros y redes sociales, y podrá probarlas usted mismo en la versión beta pública, de la cual tendremos más detalles muy pronto. En preparación para la versión beta, archivaremos las discusiones sobre Retroalimentación enfocada. Queremos agradecer una vez más a la comunidad por sus comentarios sobre todos los temas hasta ahora, ha sido inmensamente valioso. We're going to be shaking the format up slightly for the final main topic of discussion surrounding some of the major features of Chapter Four of Beyond. We're soon going to be revealing more details about the next update, so for this post, we'd like you to share all of your questions and comments in reply to this thread, and we'll try to respond to as many as we can! In this post we’ll be presenting just some of the improvements coming to exploration in the next update. There's a number of benefits that we are aiming to bring in with this exploration overhaul which we've listed out below, with more detailed explanation underneath. •Make exploration more involved: By introducing a process we aim to make exploration feel more meaningful, making the results more satisfying and rewarding. •Replace flying time with gameplay: We want to reduce the amount of time you have to spend flying to a planet just to discover it. The only time we want you to fly to a planet is because you want to visit it as there’s something there you want to see or do. Ultimately that will make exploring planetary bodies and getting first discoveries in a system quicker and more engaging at the same time. 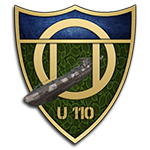 •Remove Random USS Spawning: You will now be able to use your skill to locate signal sources rather than rely on luck. you will have the ability to identify a USS from anywhere in the system and then explore and discover these locations. •Reduce the time to find planet surface locations: You will now be able to employ game play to make searching out interesting surface locations/POIs quicker and more interesting rather than flying across the planet in low orbit. •Improve multiplayer exploration: With both of the module upgrades we are making sure that wings and multi-crew are supported. •Holistic System:The improvements to exploration mechanics tie together not just new discoveries, but mining, missions and signal source location in one package. •All new "First mapped": You'll be able to add a first mapped across any planet within the galaxy, including within the bubble. Giving all players that have joined the game since it's launch even more opportunity to make their mark on the galaxy. Because explorers ply their trade far from civilized space, we’ve decided to not add new module requirements. Instead, we’re improving the discovery scanner and detailed surface scanner so Commanders can jump right in as soon as the update is released, without having to spend time traveling back to a port to purchase new gear. When you activate the discovery scanner you will now be taken to an all-new scanning interface and view. In this augmented camera view you are able to interrogate the system using new functionality of the scanner. The system scan now returns an aggregated display of how energetic the electromagnetic emissions are in the system. Signals are sorted on a low to high scale by their apparent energy. For example, emissions from rocky clusters will appear at the lower end of the scale, hot gas giants at the upper range. This information requires some interpretation as signals can overlap. You are able to tune the focus of your sensors to a particular point on the scale, making emissions from objects at this range much clearer, at the cost of filtering out signals returned from bodies not emitting at this range. As you move the view around, you are aiming your discovery scanner sensors. To aid you, the discovery scanner view also features a repeating sweep of gravitational disturbance detected in the system. You can use this sweep to narrow your search for stellar bodies, as well as start your search around the star's orbital plane, which is revealed by the initial system scan. As you locate and identify stellar bodies their emissions are filtered out, instead becoming markers on the energy range, making it easier to find the remaining bodies. It's at this point in that you will gain the “first discovered” tag, rather than having to physically visit the planet (you still need to sell the data at a port to gain the tag). All current first discovered tags will remain. Along with the Exploration update, we are improving the way that USSs work. USSs will now spawn throughout the entire system when you first enter it. This enables you to use the new exploration tools to find USSs throughout the system, not just in the area around you. You can still interrogate nav beacons to find the locations. Whilst USSs do still have a decay time, the timers have been increased to allow you time to find and fly to the ones you are interested in. The decay time is also now displayed when targeted. Signal sources still obey rules determining where they can appear within a system, and mission critical signal sources will still be highlighted to differentiate themselves once located. Again, this module will not be replaced. Instead, the detailed surface scanner gains the ability to launch micro sensor probes in supercruise. You will use these probes to “map” a planet’s surface and locate resource hotspots in its rings. These flight-assisted probes are launched via a new aiming interface when activating the detailed surface scanner. The probes will arc towards a planet’s surface and when close enough will “display” sensor coverage over a large area. Once enough of the surface has coverage, the probes will collate and report their findings. To map rings around a planet you need to hit each ring with a single probe. You will be able to synthesise micro-probes for the detailed surface scanner, but the better aim you are, the less probes you will need to get complete coverage. When you do achieve this, any unusual locations will be revealed to your ship’s navigation systems. So no more eyeballing an entire planet to find those brain trees! We are also adding a new opportunity to get your Commander's name immortalised in the game with the new 'First Mapped By' tag. The first person to successfully map a planet to 100% and sell the resulting data at a port, will be awarded this tag. This also applies for planets that have already got a 'First Discovered' tag as well. As part of the exploration update, we are making sure that multi-crew members can use the discovery scanner and detailed surface scanner at the same time and all discoveries are shared among crew or wing. This allows wings or commanders in multi-crew to engage in exploration together, each earning credits and exploration rank and making the process more efficient. 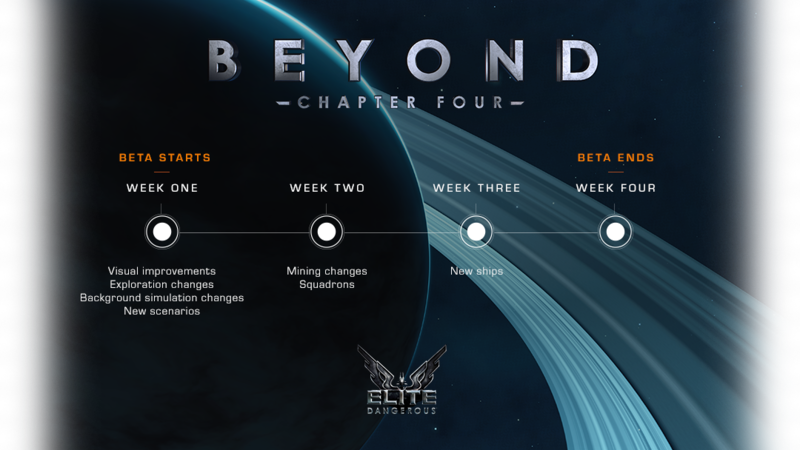 We'll be revealing more details about Beyond - Chapter Four in the coming weeks and we can't wait to show you, but in the meantime, please post your feedback regarding Exploration in this thread and we'll try to respond to as many queries as we can. This particular thread is not an area for debate between community members – it’s fine to read what others have put, but try to ensure your posts are directed at us rather than your fellow posters. Vamos a sacudir el formato ligeramente para el tema principal de discusión final que rodea algunas de las principales características del Capítulo Cuatro de Beyond. Pronto van a revelar más detalles sobre la próxima actualización. En esta publicación, presentan solo algunas cosas de las mejoras que llegarán a la exploración en la próxima actualización. Hay una serie de beneficios que pretenden aportar a la exploración con esta revisión. •Hacer que la Exploración esté más Involucrada: Al presentar un proceso, buscan que la exploración sea más significativa, haciendo que los resultados sean más satisfactorios y gratificantes. •Reemplazar el Tiempo de Vuelo: Reducir la cantidad de tiempo que tienes que pasar volando a un planeta solo para descubrirlo. La única vez que queremos que vueles a un planeta es porque quieres visitarlo, ya que hay algo que quieres ver o hacer. En última instancia, eso hará que explorar los cuerpos planetarios y obtener los descubrimientos en un sistema sea más rápido y atractivo al mismo tiempo. •Elimina la Aparición Aleatoria de USS (Unidentified Signal Sources): Ahora podrás utilizar tu habilidad para localizar fuentes de señal en lugar de confiar en la suerte. Tendrá la capacidad de identificar una USS desde cualquier lugar del sistema y luego explorar y descubrir estas ubicaciones. •Reducir el Tiempo para Encontrar Ubicaciones en la Superficie del Planeta: Ahora podrás utilizar el juego para buscar ubicaciones de superficie o POI (puntos de interés) más rápido e interesantes en lugar de volar por todo el planeta en órbita baja. •Mejorar la Exploración Multijugador: Con ambas actualizaciones del módulo, nos aseguramos de que las alas y la tripulación múltiple sean compatibles. •Sistema Holístico: Las mejoras en la mecánica de exploración unen no solo los nuevos descubrimientos, sino también la minería, las misiones y la ubicación de la fuente de señal en un solo paquete. •Todo nuevo “Primer Descubrimiento”: Podrás agregar un primer descubrimiento a cualquier planeta dentro de la galaxia, incluso dentro de la burbuja. Dando a todos los jugadores que se han unido al juego, ya sea desde el lanzamiento, más oportunidades para dejar su huella en la galaxia. Debido a que los exploradores manejan su comercio lejos del espacio civilizado, hemos decidido no agregar nuevos requisitos de módulos. En cambio, estamos mejorando el escáner de descubrimiento y el escáner de superficie detallado para que los Comandantes puedan acceder a él directamente tan pronto como se lance la actualización, sin tener que perder tiempo viajando de regreso a una estación para comprar el equipo nuevo. Cuando actives el escáner de descubrimiento, accederás a una nueva interfaz y vista de escaneo. En esta vista de cámara aumentada, puedes ver al sistema utilizando la nueva funcionalidad del escáner. El proceso aún comienza con el “bocinazo” (exploración del sistema), aunque su uso es ahora el comienzo de un proceso más atractivo (si todo por lo que lo hiciste antes fue por buscar algunos créditos, no te preocupes, el escaneo aún otorga créditos). El escaneo del sistema ahora devuelve una visualización agregada de cuán enérgicas son las emisiones electromagnéticas en el sistema. Las señales se ordenan en una escala de baja a alta por su energía aparente. Por ejemplo, las emisiones de los cúmulos rocosos aparecerán en el extremo inferior de la escala, los gigantes de gas caliente en el rango superior. Esta información requiere alguna interpretación ya que las señales pueden superponerse. Puedes sintonizar el foco de tus sensores en un punto particular de la escala, haciendo las emisiones de los objetos en este rango mucho más claras, a costa de filtrar las señales devueltas desde cuerpos que no emiten en este rango. A medida que mueves la vista, apuntas a los sensores del escáner de descubrimiento. Para ayudarlo, la vista del escáner de descubrimiento también presenta un barrido repetido de perturbación gravitacional detectada en el sistema. Puedes utilizar este barrido para limitar tu búsqueda de cuerpos estelares, así como comenzar su búsqueda alrededor del plano orbital de la estrella, que se revela en el escaneo inicial del sistema. Las emisiones que se acercan lo suficiente al enfoque de tu vista se representan mediante patrones de firma alrededor de un retículo central. Si está sintonizado en el punto correcto en la escala de energía, la señal se mostrará como un patrón simétrico que muestra claramente la dirección hacia el origen de la señal, lo que le permite ubicarla. Mientras más lejos estés de la afinación energética, más distorsionado y asimétrico se vuelve el patrón, ocultando la dirección y ubicación precisa. Una vez que tienes un candidato origen, puedes usar el escáner para reconstruir una vista ampliada masivamente. Si apuntaste con precisión, descubrirás el cuerpo estelar. Si hay una cantidad de cuerpos estelares relativamente cerca de su foco, puedes necesitar repetir el proceso para aislar las señales individuales. A medida que localizas e identificas los cuerpos estelares, sus emisiones se filtran, convirtiéndose en marcadores en el rango de energía, facilitando la búsqueda de los cuerpos restantes. Es en este punto en el que obtendrás la etiqueta de “Primer Descubrimiento”, en lugar de tener que visitar físicamente el planeta (aún necesita vender los datos en una estación para obtener la etiqueta). Todas las etiquetas de “Primer Descubrimiento” se mantendrán. Es importante destacar que cuando descubras un planeta utilizando el escáner de descubrimiento, además de estar informado de los recursos disponibles en él, también se revelará la presencia de ubicaciones inusuales, como los sitios Guardián. Sin embargo, su ubicación precisa no se mostrará hasta que hayas mapeado el planeta con el escáner de superficie detallado. Junto con la actualización de Exploración, estamos mejorando la forma en que funcionan las USS (Unidentified Signal Sources). Las USS ahora aparecerán en todo el sistema cuando ingreses por primera vez. Esto te permite usar las nuevas herramientas de exploración para encontrar las USS en todo el sistema, no solo en el área que te rodea. Todavía puedes interrogar en las balizas de navegación para encontrar las ubicaciones. Mientras que las USS todavía tienen un tiempo de desintegración, los temporizadores se han aumentado para que tengas tiempo de encontrar y volar a hacia las que te interesen. El tiempo de desintegración también se muestra ahora cuando se selecciona como objetivo. Las fuentes de señal siguen obedeciendo reglas que determinan dónde pueden aparecer dentro de un sistema, y ​​las fuentes de señal de misión crítica aún se resaltarán para diferenciarse una vez localizadas. De nuevo, este módulo no será reemplazado. En cambio, el escáner de superficie detallado gana la capacidad de lanzar sondas de micro sensores en supercrucero. Utilizará estas sondas para “mapear” la superficie de un planeta y localizar puntos de acceso de recursos en sus anillos. Estas sondas asistidas por vuelo se lanzan a través de una nueva interfaz de apuntamiento cuando se activa el escáner de superficie detallado. Las sondas se arquearán hacia la superficie de un planeta y cuando estén lo suficientemente cerca “mostrarán” la cobertura del sensor en un área grande. Una vez que suficiente superficie tenga cobertura, las sondas se cotejarán e informarán sus hallazgos. Para mapear anillos alrededor de un planeta, debes golpear cada anillo con una sola sonda. Para permitir un juego habilidoso, puedes apuntar las sondas lejos del planeta, permitiéndoles rodearlo con un arco, y potencialmente permitirte golpear la superficie del otro lado del planeta. Si apuntas demasiado lejos, la sonda pasará directamente y se perderá, pero al utilizar la información de masa y tamaño que se muestra en el HUD, podrás lanzar sondas y obtener cobertura completa sin tener que volar alrededor del planeta. Podrás sintetizar micro-sondas para el escáner de superficie detallado, pero cuanto mejor seas con tu objetivo, menos sondas necesitarás para obtener una cobertura completa. Cuando logres esto, cualquier ubicación inusual será revelada en los sistemas de navegación de tu nave. ¡Así que no más miradas a un planeta entero para encontrar esos árboles inteligentes! También están agregando una nueva oportunidad para inmortalizar el nombre de tu Comandante en el juego con la nueva etiqueta “Primer Descubridor por’. La primera persona en asignar con éxito un planeta al 100% y vender los datos resultantes en una estación, recibirá esta etiqueta. Esto también se aplica a los planetas que ya tienen una etiqueta de “Primer Descubrimiento”. Como parte de la actualización de exploración, nos aseguramos de que los miembros de múltiple tripulación puedan usar el escáner de descubrimiento y el escáner de superficie detallado al mismo tiempo y todos los descubrimientos se comparten entre la tripulaciones o las alas. Esto permite que las alas o los comandantes en multi-tripulación participen juntos en la exploración, ganando cada uno créditos y rango de exploración y haciendo que el proceso sea más eficiente. Revelarán más detalles sobre Beyond – Capítulo Cuatro en las próximas semanas, pero mientras tanto, publica tus comentarios sobre Exploración en este hilo y tratarán de responder a todas las consultas cuando puedan. Este hilo en particular no es un área de debate entre los miembros de la comunidad; está bien leer lo que otros han dicho, pero trata de asegurarte de que tus publicaciones se dirijan a los desarrolladores en lugar de a tus compañeros. Muchas gracias al equipo de UnionCosmos. Ya tenemos hoja de ruta para la beta de la expansión gratuita 3.3 de Beyond. Con mucha anticipación, anunciaron que la versión beta del Capítulo Cuatro estará disponible para todos los jugadores de PC de Elite Dangerous y Elite Dangerous: Horizons el martes 30 de octubre. Las diferentes versiones de la beta se publicarán el martes de cada semana. Informarán en los foros oficiales de Noticias y Anuncios a medida que cada actualización esté disponible. El modo de análisis con el Discovery Scanner mejorado y el Scanner de Detalles de Superficie, es una forma nueva y revolucionaria para que todos los comandantes exploren la galaxia Vía Láctea. Después de la exploración inicial del sistema, podrás ajustar tus escáneres para encontrar cuerpos estelares y otros fenómenos. Las fuentes de señal no identificadas y las zonas de conflicto también aparecerán como líneas de puntos en este modo, lo que te permitirá rastrear fácilmente cosas interesantes o importantes dentro del sistema. Este nuevo sistema no solo es una experiencia de exploración más realista, satisfactoria y atractiva, sino que ahora podrás tomar decisiones más informadas sobre dónde buscar a continuación, y será más recompensado por tu tiempo dedicado a la exploración. Los comandantes ahora tendrán sondas a su disposición para mapear las superficies planetarias, y los anillos planetarios, en detalle, para ubicar puntos de interés y dejar su marca en la galaxia de una manera diferente. Todo lo anterior, además del nuevo códice en el juego, donde los Comandantes verán una nueva forma de registrar sus hallazgos de forma colaborativa e individual, son solo algunas de las cosas que vienen con los cambios en la exploración. Estos son apenas detalles de los cambios en la exploración, así que asegúrese de sintonizar la transmisión en vivo el 18 de octubre para obtener más información. Los cinturones de asteroides y los anillos planetarios están a punto de ponerse muy ocupados. Las nuevas herramientas y mecánicos proporcionarán una experiencia de minería nueva, emocionante y lucrativa para todos los comandantes de Elite Dangerous. Usando nuevos mecanismos de exploración, los mineros pueden investigar anillos para ubicar los mejores lugares para comenzar sus sesiones de minería, y luego los mejores asteroides específicos para sondear y excavar para obtener recompensas. Con la cantidad adecuada de habilidad y experiencia, el nuevo Desintegrador de Abrasión, el misil de desplazamiento en la superficie y el lanzador de carga sísmica proporcionarán resultados emocionantes y explosivos. ¿Quieres profundizar en estas características y aprender más sobre la minería? Sintonice la transmisión en vivo el 1 de noviembre para obtener más información. Los escuadrones son una nueva forma de unir a los Comandantes de ideas afines para apoyar a las facciones de su elección, participar juntos en las misiones comunitarias y competir por los primeros puestos en las tablas de clasificación semanales. Las nuevas herramientas de comunicación, incluidos los canales de chat en el juego, te ayudarán a abrir senderos y a dejar la marca de tu Escuadrón en la galaxia. Conoce más sobre los Escuadrones en la transmisión en vivo el 30 de octubre. Hay varios otros cambios enormes que vienen a Elite Dangerous, que incluyen mejoras visuales, actualizaciones de la simulación de fondo y (aún por revelar) cambios en la interfaz de la cabina, y otras características. Antes de la introducción del contenido en la versión beta, hay organizadas varias transmisiones en vivo de inmersión profunda con los desarrolladores, donde mostrarán el contenido y tendrás la oportunidad de expresar tus preguntas y comentarios. Exploración, códice y mejoras visuales – 18 de octubre (19:00 BST). Interacciones de la BGS y escenarios – 25 de octubre (19:00 BST). Escuadrones – 30 de octubre (19:00 GMT). Minería – 01 de noviembre (19:00 GMT). Las naves – 8 de noviembre (19:00 GMT). Si no puedes presenciar las transmisiones en vivo ¡no te preocupes! Publicaremos un resumen de todo el contenido presentado poco después de cada transmisión. Después de ver el vídeo del livestream sólo puedo decir: ¡¡¡FANTÁSTICO!!! Todo el tema de exploración me parece muy acertado, mucho mejor de lo que me esperaba. Por ponerle un pero, no obligan a bajar a los planetas a la recogida de muestras. El planetario también alucinante: por fin podemos ver los sistemas en 3D. En cuanto a todo el tema de los menús y tal, son adecuados. Nos obligarán a recomponer las configuraciones del VoiceAttack, pero bueno, es un mal menor. Y muy bien el Codex. Muy muy bien por parte de Frontier. Como ya he dicho en otras ocasiones, esperemos que este sea el resurgir del desarrollo de esta maravilla de juego que, hoy, lo es un poquito más. Lo que me ha dejado un poco frío y no muy convencido es el tema de la iluminación. Ya veremos. If you missed tonight's content reveal livestream or just wanted a recap of all the content discussed, read the notes below from designer Adam Bourke-Waite and Executive Producer Adam Woods. Using the above tools will allow you to find everything in the system without having to fly towards it. If you find something worth investigating, whether that’s an Earth-like world or a mineral rich planetary ring, you can fly towards it and use the Detailed Surface Scanner to map the planet (or ring) and get a satisfying '100% completion' for mapping the body, as well as a bonus credit reward. 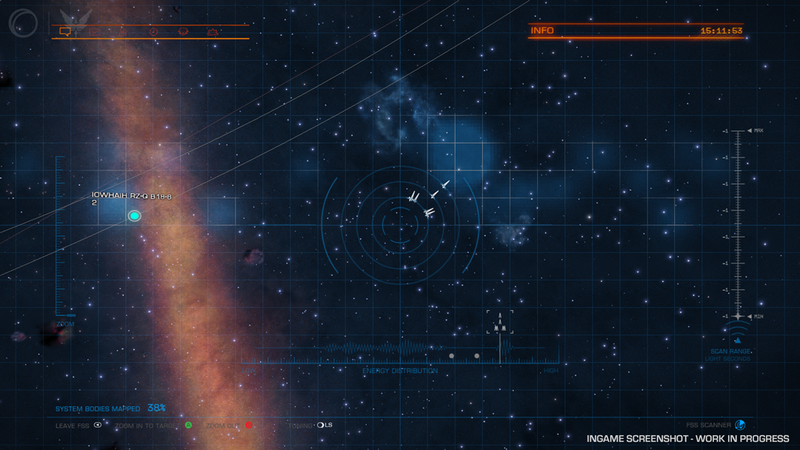 Points of Interest - When using the Full System Scanner you will be able to track signals that are not stellar bodies. These other signals will display the location of Unidentified Signal Sources, Conflict Zones, and more. These signals are shown as dotted circles in order to differentiate them from stellar bodies. Once you zoom in on them (as detailed above), you will then be able to lock on to it in order to locate it in Supercruise. Mission - Missions will now have specially coloured pips and markers to help you differentiate them from other signals. Unidentified Signal Sources - In Beyond - Chapter Four Unidentified Signal Sources have also been updated. Rather than being a constantly spawning set of signals, the system now spawns an entire set of them when you arrive. These will remain in the system for a certain amount of time and Commanders will have a timer that indicates how long it is before they disappear. These signals will also persist when you leave for another system and come back, as long as it is within the visible timeframe. Home Page - In the home page of the Commander section, you'll find a full length picture of your Holo-me avatar, your current Elite ranks and their progress and an overview of other quick reference Commander stats. Session Log - The session log tracks certain in-game activities based on the already existing player journal. Statistics - The statistics page is a neater, clearer and more concise way of displaying information that was previously found in the right-hand panel of your cockpit. Archive - The archive is your very own library, a collection curated by your discoveries. Any audio and text log you uncover across the galaxy (such as those found from abandoned settlements, Generation ships and other points of interest) will be added here. Audio logs in the archive can also be added to your playlist for easy listening while out exploring in the black! 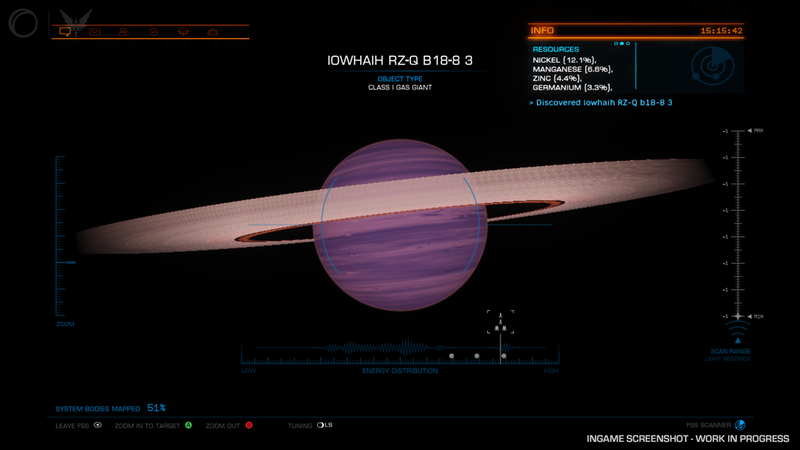 Within each system, there are variety things for you to discover, such as stars, terrestrials and gas giants - and even more! Rumoured - If an item is listed as rumoured that means there is a possibility of finding it within that region. Reported - When a Commander finds the rumoured item in question, it then shows up as ‘reported’ in the Codex, and update everyone’s Codex . If you then find it, and scan it, that will then become ‘Discovered’ in your codex. If you’re hoping to be an intrepid explorer and find things that haven't been discovered, you can - and set off that cycle of Rumoured, Reported, Discovered! The Knowledgebase is your hub for brushing up on Elite Dangerous lore! It's also the place for information about the Thargoids and other articles of historic importance. Transactions - You are now able to apply filters to your transactions tab, so you will be able to isolate whether you want to see such things as your missions, passenger contracts, combat bonds, bounty claims and any fines or bounties you have incurred. Contacts - Contacts now has a context sensitive button that allows quicker access to commonly used actions such as ignoring materials and commodities to scoop and requesting docking. Target - We have streamlined the sub targets and cargo tabs in to one single location now called ‘Target’. After the relevant scans this will now show a target’s sub-targets and manifests (cargo, passengers etc). Comms. Panel - The comms panel now includes a new social tab that encompasses any multi-crew options, any pending invites (wing, multi-crew, friends), and information on any online friends. Squadrons - The Squadrons tab has been added. Please tune in to our later livestream on Squadrons to learn more about this. Home - The ‘Home’ tab contains your ranking information, important information about balance, rebuy cost, notoriety and the ship you’re in. It contains quick access to various features such a GalNet, Holo-me, The Codex and Squadrons. The playlist quick play buttons are also contained in this tab. Fire Groups - Fire groups are now assigned with letters rather than numbers to remove any confusion between fire groups and primary and secondary fire buttons. Ship - The new contextual vehicle (SRV or ship) tab replaces the functions tab with ship functions, pilot preferences, and statistics for the vessel that you’re in. Status - The new status tab now lists information on local system factions, your reputation with the super powers and the Power you are aligned with, a summary of your current session log, your financial information, and any permits you currently have access to. Playlist - The new playlist tab allows you to create your own personalised playlists from the various audio content, including audio logs and GalNet news. Tune in to our next livestream (on 25 October) centered around new Scenario Interactions and the Background Simulation changes coming in Beyond - Chapter Four!